I like to look on camping as the art of blending in with nature, use all that is available to me on the land and leave nothing behind. It is my chance to leave the gadgets and technology behind and go turn into an adventurer. In times gone by people could tie all sorts of knots, feed off the land and survive on pretty much nothing except clean water and some food. Yep I used to think I could do that but then the kids arrived and things changed dramatically. You see their idea of adventure is getting to a new level on a video game or perhaps eating their lunch in the garden. They would never think of heading out into the wild on an adventure – no longer safe for them to do it on their own anyway. When we head off camping there are a few things I bring camping along with me and the family and things that I do that help make each camping trip that little bit more comfortable. Some may find them unnecessary and others will do it by default but its what I do and hope that this list may help out some of you the next time you pack up and head for the wild. First thing I always pack is Bug Spray. You can use nature as a source of insect repellant and this is preferable but you gotta get the kids protected before they step out into the woods or open land so sometimes a bought product is the best option. A mozzie bite can be a painful experience at the best of times but when your kids have gathered up a few bites it turns into a new level of pain for both you and them. If you want to go the natural route you can grab a handful of elderberry leaves, mash them up and rub the pulp into your skin. This will act as a suitable deterrent against getting bitten. There are other natural options available as well and Catnip is another great example of using nature to your advantage – that is if you can find some of it growing near you. It is said that Catnip is ten times more powerful that your standard Deet based sprays. Next up on the list is Fire. Now you might think that fire is the most important element of any camping trip. Try explaining that to your kids who have been chomped by mosquitos while you are getting the fire ready. In times gone by fire would have been the lifeblood of any camping adventure but nowadays with all the modern gadgets and gas powered stoves etc.. fire has taken a bit of a back seat. A quick tip I always apply here is to throw a tub of corn chips into my bag. This tasty snack is also great for starting a fire and while your kindling or twigs etc may get damp from morning dew or a sudden downpour the chips will be dry and will absolutely produce enough heat and flames to start any fire. 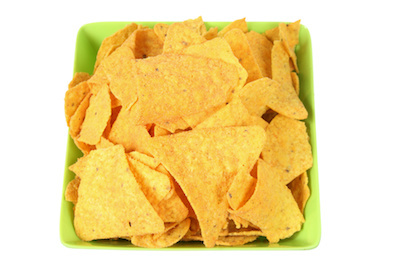 Plus you have the added advantage of eating a few of them while you are sitting around your nice warm campfire. Remember to pack a safety lighter with you or else you will just be eating the corn chips in the cold and rubbing sticks together. You could also pack a fire starter and there are many to choose from. We like this one from Amazon because its top quality and comes complete with a safety whistle. Its lightweight, hangs around your neck and seals up to keep dry so no harm in bringing one alone for the trip. The kids will be amazed when you start a fire with it so you get a few brownie points for being a cool dad who can make fire like a caveman. A neat little hack I like to use is to get a head torch and tie it to a jug of water. This will extent to light given off by the torch and provide enough to keep everybody happy in the tent. Some of the bigger lights provide more light but will chew through batteries. By using this method you can save a few dollars but still produce enough light to keep the kids happy in their tents and you will be amazed at the reactions when they see it in action. You will get the ‘My Dad is a mad scientist’ look which is quite amusing. 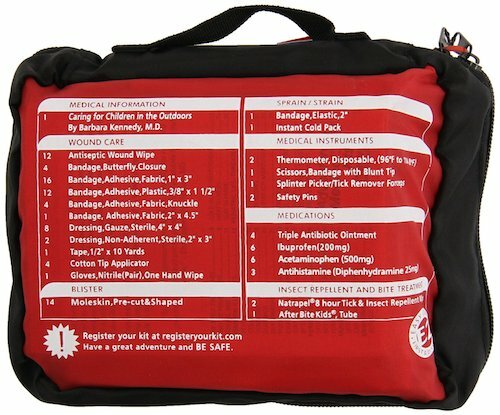 Something I always pack for camping is a good camping Family First Aid Kit. It doesn’t have to be camping specific but I find they are better equipped and lighter than your standard ones. Pick one that carries the right sort of equipment without going over the top. Throw in a small whistle on a lanyard for each member of the family and train them to use it in the event that they walk off and find themselves lost. It is an adventure remember and kids like to ramble at time. You should also throw a few bandanas into your camping bag. You can use these on hot days to keep the sun off the kids heads but also on fresh morning to keep yourself a bit warmer. In the event that somebody has a nasty trip or fall and hurts their arm you can use them to tie the injury up in a supporting position until such time as the appropriate medical attention can be sourced. Plus the kids will think they look cool wearing them so more brownie points for you and mum. If like me you love your food then bringing along a few items to spice things up a little bit is a must. While I am no master chef by any stretch of the imagination I like to think I can cook a good steak, burger or chicken and find having a few extra spices and flavourings in the rucksack helps keep the palates happy. For this little trick I use old tic-tac boxes to store up my spices. They are small and compact, very light and near enough waterproof. Bring a few along next time you go camping and wow your guests with tasty spicy food. Nothing wrong with five star camping food if you ask me..
You might feel this an unnecessary thing to take camping but hey it works for me and takes up little or no room anyway. WE are not talking about extreme survival here just an enjoyable camping trip with the family. You have to remember that when you are camping you will not have all the creature comforts that you have at home and eventually you will have to use the big restroom in the forest. If you are lucky you will have the facilities available to you and if so happy days. Other times you may not be so fortunate and may have to improvise. The single biggest frustration for me is toilet paper – annoying when it gets damp in the tent and even worse when there is none. To overcome this challenge I like to pack it in an airtight tin of some description – an old coffee can is perfect for this. 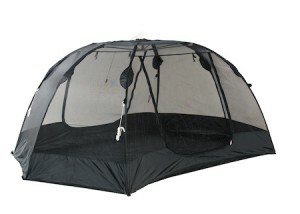 It helps keep it dry when stored in a tent and also means you have some with you at all times. 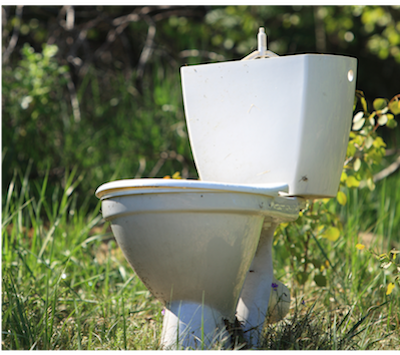 If you want to provide the complete package when you are out camping then you are going to need something like a Camping Travel Toilet. This might seem like a bit of overkill because you are supposed to be camping but the shelter can be used as a changing area or somewhere to hang you portable shower if you have that luxury. The final point I want to cover here is personal hygiene. You teach your kids to wash their hands all the time to avoid infections and well, just to keep clean and healthy so a camping trip should follow some of the same rules. Ok I understand we are trying to be at one with nature but still clean hands make for happy health kids so keep that in mind. As a minimum you want to bring some soap for washing your hands and dishes. Remember that you are out in a natural environment so chemical free natural soap only please. We found this one on Amazon. It is environmentally friendly and can be used to wash you, your gear or your clothes. It is odour free as well which is important if you are in Bear country. There is no art to camping. It is what it is, but there are things you can do and things you can take along that make things that little more comfortable for you and the family. These are mine and sometimes there are more. It just depends where we are going and what facilities are available when we get there. As pointed out earlier this is not meant to be a must have list of camping essentials – there are a thousand other well documented lists available so why re-invent the wheel. Thanks for stopping by wildgetaway.com and we hope to see you again some day. Either here our out in the wild. Why not join the conversation and tell us what you bring on your camping trips. We would love to hear from you and share the tips with the rest of our readers.